NOT SO FAST Chairman of Sonoma County Board of Supervisors James Gore, center, and Santa Rosa Vice Mayor Chris Rogers, right, discuss the importance of protecting future wildfire victims from proposed legislation to change utility liability laws. Taxpayers and victims may foot the bill for future natural disasters caused by utilities companies if proposed state legislation passes, wildfire survivors and local government representatives said at news conference in Santa Rosa July 11. 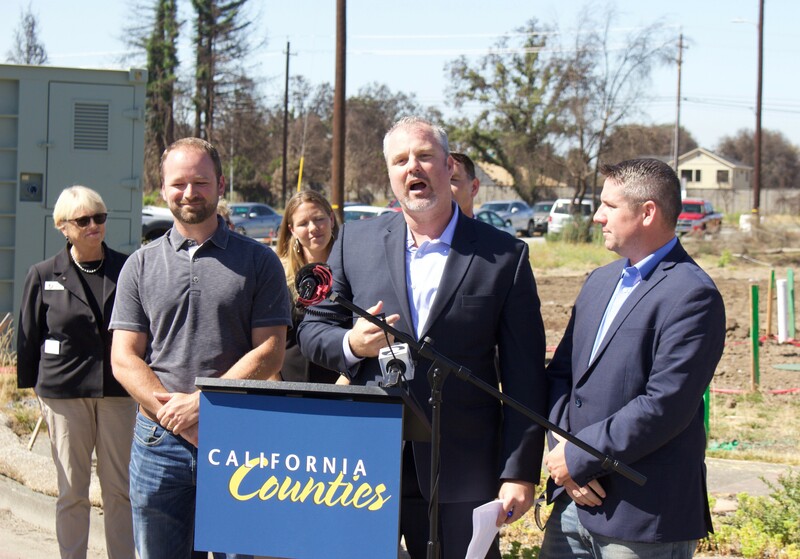 Supervisors from Sonoma, Napa and Mendocino counties joined wildfire survivors in front of where Wikiup resident Brad Sherwood’s fire-destroyed home once stood, urging lawmakers block the proposed legislation, which would make it more difficult for victims like those of the October, 2017 wildfires to sue for damages against utility companies. The legislation, currently under review by a special committee of state legislators, would abolish “inverse condemnation” laws, a cornerstone in establishing liability for investor-owned utilities like Pacific Gas and Electric. Under inverse condemnation, public utility companies, which work closely with local and state governments, are held liable for any damages to property they cause, regardless of negligence. “[The legislation] would essentially shift their liability onto the taxpayers in the event of damage and destruction,” said Cyndi Foreman, fire prevention officer for Rincon Valley/Windsor Fire Protection District. Supervisor Gore listed three demands for the state legislature: that local governments be included in the conversation; that proposed changes to liability laws be slowed; and that partnerships form between local governments and public utilities to prevent and respond to wildfires. “We’re not here to talk about PG&E being a good company or a bad company. Any talk about ending inverse condemnation or other things—we need to be there,” Gore said. Graham Knaus, executive director of California State Association of Counties, said liability laws protect victims of utility-caused natural disasters. In a July 10 letter to Gov. Jerry Brown, Knaus defended inverse condemnation because it incentivizes utilities companies to act in the public interest while giving private citizens and local governments a fighting chance in legal battles against powerful companies. The proposed legislative changes would not work retroactively, so they would not affect October wildfire victims. The official’s main concerns were that legal changes would adversely affect communities in future disasters. According to Cal Fire, utility equipment caused 16 of the 2017 North Bay wildfires. Of those 16, Knauss said, 11 are under criminal investigation. The state legislature, currently on summer recess, will reconvene in August for its final bill-passing session of 2018.